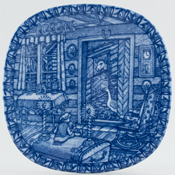 This plate is blue printed with hand applied colour. Bawo and Dotter were New York importers from 1864 to 1910. 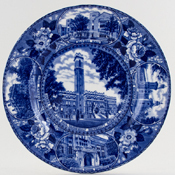 This plate bears their B&D backstamp, printed in blue, and the inscription Commodore Paul Jones capturing the Serapis September 23rd 1779, also Historical Pottery, Staffordshire, England. In brown script is 105 H, which is probably a Ridgway pattern number. Ridgway are known to have made plates for Bawo and Dotter. The glaze is finely crazed, but this is mainly visible on the back, otherwise fine. Made in England. Brand new and first quality, dishwasher and microwave safe. A lovely mug and plate set, printed in blue with motifs of the traditional prunus pattern and inscription "God Bless our Queen" with crown. Hand crafted and decorated using traditional methods at the last working Victorian pottery in Staffordshire, England, part of a heritage of fine manufacturing stretching back over 200 years. This item has been discontinued by Burleigh and is no longer available. To celebrate the birth of Princess Charlotte Elizabeth Diana, daughter of Their Royal Highnesses the Duke and Duchess of Cambridge. Printed in a soft pink with Charlotte Elizabeth Diana 02-05-2015 on one side and A new Princess on the other. Brand new and first quality china, which is dishwasher and microwave safe. Backstamp: Burleigh Made in Staffordshire England. To celebrate the birth of our new royal baby 02-05-2015. This item has been discontinued by Burleigh, and is no longer available. With gilt. A gorgeous plate to commemorate the coronation of Queeen Elizabeth II. Backstamp: Burleigh Ware Burgess & Leigh Ltd Est 1851 Burslem England. Light all over crazing and a few ink spots here and there, overall excellent condition. Made in England. 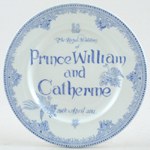 A lovely size of plate, printed in blue with the historic Asiatic Pheasants pattern and inscription "The Royal Wedding of Prince William and Catherine, 29th April 2011". Hand crafted and decorated using traditional methods at the last working Victorian pottery in Staffordshire, England, part of a heritage of fine manufacturing stretching back over 200 years. As one of a limited edition of only 1000, this plate is destined to become an antique collectable of the future. This item has been discontinued by Burleigh and is no longer available. Made in England. A pretty mug, with Union Jack flag handle, and printed in blue with the historic Asiatic Pheasants pattern and inscription "The Royal Wedding of Prince William and Catherine, 29th April 2011". Hand crafted and decorated using traditional methods at the last working Victorian pottery in Staffordshire, England, part of a heritage of fine manufacturing stretching back over 200 years. As one of a limited edition of only 1000, this mug is destined to become an antique collectable of the future. This item has been discontinued by Burleigh and is no longer available. Made in England. 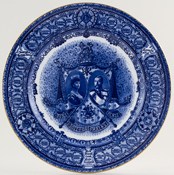 A plate of generous size, printed in blue with the historic Asiatic Pheasants pattern and inscription "The Royal Wedding of Prince William and Catherine, 29th April 2011". Hand crafted and decorated using traditional methods at the last working Victorian pottery in Staffordshire, England, part of a heritage of fine manufacturing stretching back over 200 years. As one of a limited edition of only 1000, this plate is destined to become an antique collectable of the future. This item has been discontinued by Burleigh and is no longer available. Made in England. 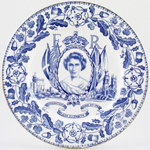 Two sizes of plate and a mug with Union Jack flag handle, all printed in blue with the historic Asiatic Pheasants pattern and inscription "The Royal Wedding of Prince William and Catherine, 29th April 2011". Hand crafted and decorated using traditional methods at the last working Victorian pottery in Staffordshire, England, part of a heritage of fine manufacturing stretching back over 200 years. As one of a limited edition of only 1000, this set is destined to become an antique collectable of the future. This item has been discontinued by Burleigh and is no longer available. Printed on the back is Made expressly for the Empire State Building by Johnson Bros., England. This famous charger or plaque was produced by Maling for Townsend & Co, China Merchants for Newcastle to commemorate the North East Coast Industries Exhibition, Newcastle upon Tyne, May 1929 Oct. More particularly it honoured Councillor Arthur W Lambert, Lord Mayor of Newcastle, Chairman of the Exhibition and joint-proprietor of Townsend. His portrait is on the front at the bottom and the main scene is a composite of the bridge and Newcastle's industries, with Maling's Pottery tucked into the left foreground. This is the early version of this scene with the words Maling's Pottery on the roof rather than the shorter Maling Ware, which was the replacement when the printing plates had to be repaired and this area re-engraved. Backstamp: North East Coast Industries Exhibition Newcastle Upon Tyne May 1929 Oct Chairman and Lord Mayor Councillor Arthur-W-Lambert Maling Est 1762 Newcastle on Tyne England and impressed date for 1929. There is some crazing to the glaze and just a little very minor wear to the foot rim on the back, overall excellent condition. Depicts Castillo de San Marcos, National Monument. Ancient City Gate and Oldest House St Augustine, Florida. Bears the importers mark of John H Roth and Co.
Depicts Lee and Jackson at Chancellorsville. Last Meeting. May 1 1863. Bears the importer's mark of John H Roth and Co. The Confederate Memorial Stone Mountain, Georgia. Set within a pretty floral border. On the back the marks of Johnroth who were the importer and wholesaler and Alfred Meakin. This plate has views of The Castillo de San Marcos National Monument, Ancient City Gate and the Oldest House, St Augustine, Florida. All set within a pretty floral border. On the back the marks of Johnroth who were the wholesaler and J Carver Harris the retailer and Alfred Meakin. Lovely plate with inscriptions Lee & Jackson at Chancellorsville Last Meeting May 1863. Printed in a pretty pale shade of mulberry. This plate features scenes from the Starved Rock State Park - The Lounge, French Canyon, The Lodge, St Louis Canyon. Superb condition. Printed backstamp "According to tradition Starved Rock received its name from an incident of Indian warfare, said to have taken place about 1769 or 1770. In 1769 the great chief Pontiac was assassinated by an Illinois Indian. Tribes friendly to Pontiac sought vengeance and legend has it that in the warfare which followed a part of the Illinois tribe was besieged on the rock, starved into submission and then annihilated" Also bears the US importers mark Johnroth. Fabulous Swedish wall plate which is pierced on the back for hanging. Backstamp: Julen Rorstrand GN R Sweden 1973 Limited Edition Colleftor's Piece. Excellent condition. With gilt. A fabulous plate commemorating the Coronation of George V. Around the rim are the Countries and States of the Commonwealth. Backstamp: Royal Doulton England Coronation of His Majesty King George V June 22nd 1911. Excellent condition. The Busy Workshop. This is the second in a planned series of six designs, although only four were issued. Brand new and first quality china, which is dishwasher and microwave safe. This item has been discontinued by Spode is no longer available. The Early Morning Start. This is the first in a planned series of six designs, although only four were issued. Brand new and first quality china, which is dishwasher and microwave safe. This item had been discontinued by Spode and is no longer available. Reindeer Round up. This is the third in a planned series of six designs, although only four were issued. Brand new and first quality china, which is dishwasher and microwave safe. This item has been discontinued by Spode and is no longer available. The Busy Workshop. This is the second in a planned series of six designs, although only four were issued. Brand new and first quality china, which is dishwasher and microwave safe.This item has been discontinued by Spode and is no longer available. The Early Morning Start. This is the first in a planned series of six designs, although only four were issued. Brand new and first quality china, which is dishwasher and microwave safe. This item has been discontinued by Spode and is no longer available. The Off. This is the fourth in a planned series of six designs, although only four were issued. Brand new and first quality china, which is dishwasher and microwave safe. This item has been discontinued by Spode and is no longer available. Small coaster to commemorate the Millennium with text on the front "To celebrate the Millennium". Backstamp: 2000 In celebration of the Millennium Spode Made in England S3668 Z. Excellent condition. 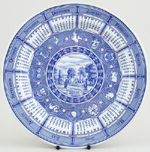 One of the popular series of Spode Blue Room Calendar Plates. This is 2006, which is the 11th in the series, and depicts Castleacre Priory in Norfolk, adapted from an original hand engraving. If you are familiar with Castleacre you will know that the ruins today are some of the most evocative of medieval monastic life. Brand new and first quality china, which is dishwasher and microwave safe. This item has been discontinued by Spode and is no longer available. Reindeer Round up. This is the third issue in a planned series of six designs, although only four were issued. Made in England. Brand new and first quality china, which is dishwasher and microwave safe. This item has been discontinued by Spode and is no longer available. Lovely 1997 Calendar plate with Greek pattern to the centre. Backstamp: The Spode Blue Room Calendar Plate 1997 Greek. The second in the series, adapted from an original hand engraving. Spode Made in England. Excellent condition. Backstamp: The Spode Blue Room Calendar Plate 2000. The fifth in the series, produced to celebrate the Millennium. Spode Made in England. Excellent condition. Gorgeous plate. Backstamp: The Spode Blue Room Collection Christmas Plate Number 5. This plate is the fifth in a series. Each illustration is inspired by an early Victorian Drawing. Spode Made in England and date letter code for 1999. Excellent condition. Gorgeous plate. 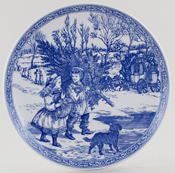 Backstamp: The Spode Blue Room Collection Christmas Plate Number 1. This plate is the first in a series. Each illustration is inspired by an early Victorian Drawing. Spode Made in England and date letter code for 1995. Bone China. 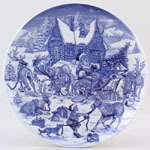 Backstamp: The seventh Spode Christmas Plate a limited production for the year 1976, with the inscription "Good King Wenceslas looked out, On the Feast of Stephen, When the snow lay round about, Deep and crisp, and even". Spode England Bone China. Excellent condition. Bone China. Twelfth in the series. With inscription on the back "Make we merry more and less, For now is the time of Christemas, of Christemas, of Christemas. Let no man come into this hall, Nor groom, nor page, nor yet marshall, But that some sport he bring withall"
Bone China. Tenth in the series and inscription on the back "Away in a manger, no crib for a bed. The little Lord Jesus laid down His sweet head, The stars in the bright sky looked down where He lay, The little Lord Jesus asleep on the hay." Bone China. Complete with original box. 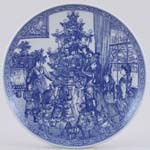 Backstamp: The eighth Spode Christmas Plate a limited production for the year 1977. The holly and the ivy, When they are both full grown, Of all the trees that are in the wood, The holly bears the crown" Spode England Bone China. The box is quite shabby but the plate is in excellent condition. Bone China. Sixth plate in the series with inscription on back "The holly's up, the house is all bright, The tree is ready, the candles alight: Rejoice and be glad, all children tonight!" Bone China. No 1 entitled "Sleigh Ride" first in Pastimes series of six plates. Part of the Christmas Tree Commemorative 70th Anniversary Collection. Brand new and first quality china, which is dishwasher and microwave safe. This item has been discontinued by Spode and is no longer available. Brand new and first quality china. This item has been discontinued by Spode and is no longer available. Brand new and first quality china. Printed on the back World of Christmas Carolling Jingle Bells. 2nd in series. Singing at Christmas is one of the oldest and most popular customs throughout the world during the festive season. The second design is inspired by "Jingle Bells" (a carol originally named "One Horse Open Sleigh") and composed in 1857 by James Lord Pierpoint for a Thanksgiving celebration at his church in Boston. This item has been discontinued by Spode and is no longer available. To celebrate the 60th Anniversary of the Coronation of HM Queen Elizabeth II. Gift boxed with Spode Certificate of Authenticity. A Mug in the Blue Room range, made in England. Brand new and first quality china, which is dishwasher and microwave safe. This item has been discontinued by Spode and is no longer available.